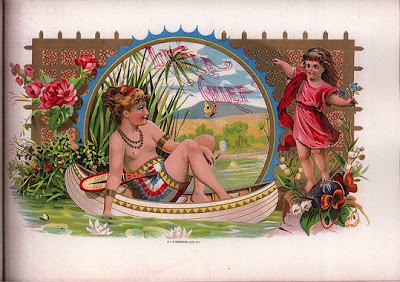 Why this example of cigar box art is entitled "Little Chief" is unusual inasmuch as it juxtaposes the exotic Nile with a Native American canoe and a voluptuous, yet white, Egyptian princess. Her skirt is in a Native American motif, as is the decorative "saw blade" design on the edges of the canoe - the canoe is in the iconographic image but the canoe itself is not constructed of Indian materials or in an Indian fashion. The vessel is not birch bark, but made of wooden slats. She, likewise, is smoking a cigar. The little girl's role on the right hand side is hard to decipher. In any event, there seems to be no political symbolism in this picture, but perhaps only 19th-century eroticism or male sexual fantasy. Certainly the woman is not "Little Chief" although she is paddling an "Indian" canoe while allowing her breasts to be exposed. Still, the name "Little Chief" is curious - maybe the title of a play or some 'legitimate" painting of the 19th century.